Even though the most common MBA careers are those in the areas of consulting, banking and finance, there are other options out there. In fact, you’d be surprised to learn which companies truly value hiring MBAs into high paying management positions, and the sectors those firms occupy. Whether its tech, media, or retail, here’s a breakout of five surprisingly lucrative MBA destinations. Facebook COO Sheryl Sandberg once said that an MBA isn’t necessary to work in tech. That’s certainly not the case at Microsoft. Satya Nadella, Microsoft CEO and University of Chicago Booth School of Business MBA graduate, told the Financial Times that Microsoft hires several hundred MBAs a year from nearly 150 different schools in 40 countries. In fact, the company is among the top-five tech hirers of MBA students from leading business schools, including INSEAD, the Stanford Graduate School of Business, and the University of Pennsylvania’s Wharton School. These hires are placed into jobs in technology evangelism, finance, marketing, operations, and sales in more than 70 countries. Once considered the old guard of the tech sector under Nadella, Microsoft has pivoted from its traditional role as a software company to a services company. This transition has created an greater need for business innovation that makes Microsoft a more attractive target for MBAs than ever. The company also takes good care of it’s MBA hires, as Microsoft’s rank as one of the best companies to work for by both Fortune and Forbes. 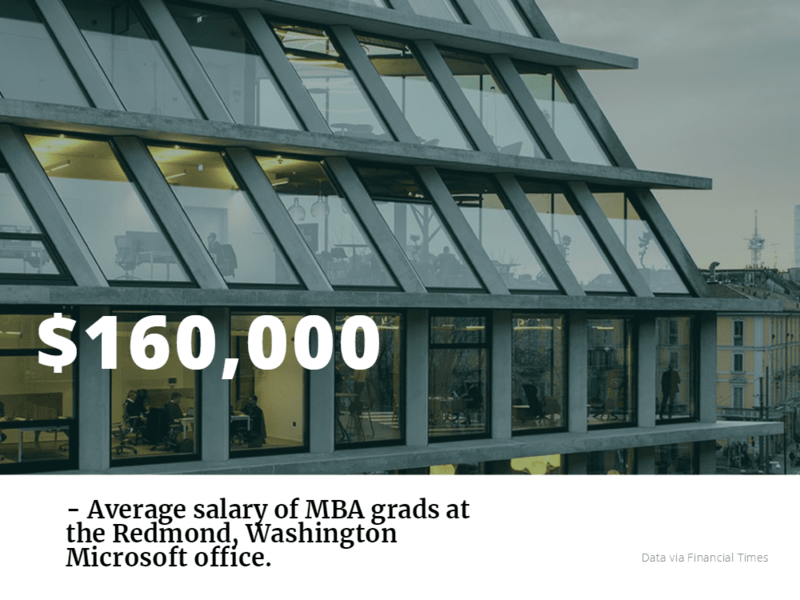 According to the Financial Times, median starting salaries and signing bonuses for MBA graduates at the Redmond, Washington-based headquarters are just over $160,000 for finance managers, product marketing managers and business program and strategy managers. In 2017, Microsoft hired about 30 percent more MBAs than the previous year, with many recruited from its summer internship program. Microsoft also puts new MBA hires through its Microsoft Academy for College Hires (MACH) program to prepare them for full-time roles. MACH is an accelerated career development program designed to recruit, hire and develop top-performing MBA graduates. The eight-month program is different from an internship in that it runs alongside a full-time job. Like Microsoft, Apple is another tech giant led by an MBA, with Apple CEO Tim Cook earning his from Duke’s Fuqua School of Business. Since taking over in 2011, the Cook-led Apple has increased its recruitment of MBAs. Instead of looking elsewhere for talent, the company now looks to MBAs with a strong understanding of consumer products, passion, and detail-oriented work ethic. According to Paysa, these candidates are also well paid. An MBA Candidate at Apple earns an average of $116,766, ranging from $96,087 at the 25th percentile to $133,654 at the 75th percentile, with top earners earning more than $155,052. Ultimately, as Cook’s accession to the Apple’s highest office shows, an MBA means plenty of room for growth at the company. Some senior directors can make more than $300,000, making it among the most lucrative MBA tech positions out there. One of the best ways to get hired at Apple is through the company’s MBA internship program. The company recruits at leading business schools, including Harvard Business School, the Carey School of Business, Stanford Graduate School of Business, UC Berkeley-Haas, CMU’s Tepper School of Business, and Duke. The Walt Disney Company typically elicits thoughts of movie studios, theme parks, cruises, and certain mice. But behind the magic are plenty of MBAs working in Disney’s movie studio divisions, global resorts and theme parks, movie studio division, or broadcast media companies, which include ESPN and ABC. 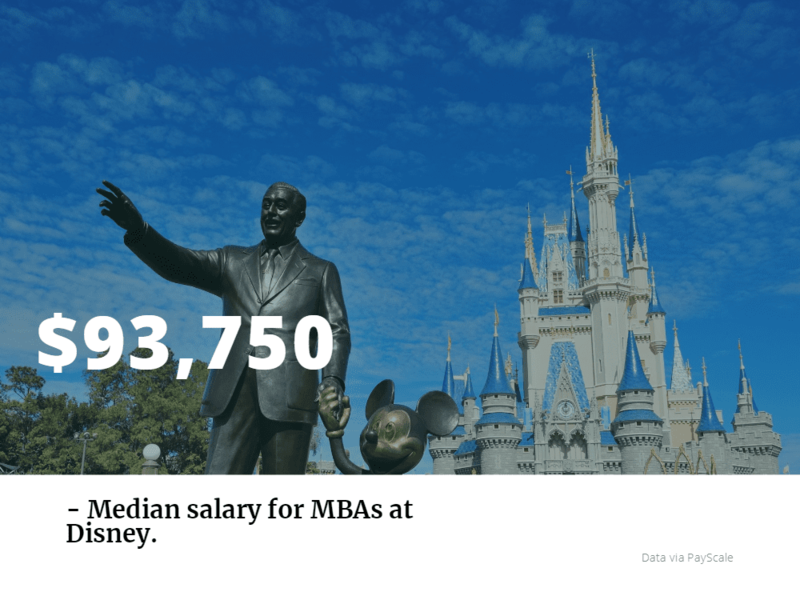 According to PayScale, MBAs at Disney have a median salary of $93,750. Not bad considering you get to work for the most magical company on Earth. To help bring in MBA talent, Disney offers internships to students of top-tier b-schools, who get opportunities to showcase their skills to the top executives. The Disney Professional Internship provides hands-on, real-world work experience. Interns become integral team members that are relied upon to deliver results. Summer interns present to the senior management and network with industry leaders. Six-month paid co-ops are also available to recent graduates. Recent graduates of accredited schools qualify for a six-month professional co-op, available from January to July or July to December. You may be thinking that Microsoft, Apple and Walt Disney making this list isn’t TOO surprising given the sheer size and impact of the companies. So here’s one that’ll really surprise you: Adobe Systems. Believe it or not, Adobe ranked 76th on Universum’s 2016 Employer Ranking for MBAs. It has also spent 16 years on Fortune’s 100 Best Companies to Work For. Thanks to its software, cloud systems, and marketing services, the Fortune 500 company has become a recognizable brand and sought after landing place for MBA talent. New hires can work in almost any department, but most work within product management and development. All Adobe employees are product evangelists. Adobe also pays its employees well. The average MBA earns $130,000 as a base, not including signing bonuses, relocation fees or performance bonuses, according to Payscale. That salary is just a little higher than the median salary of an MBA in tech. Many MBAs are exposed to Adobe during its business case competition. The Adobe Analytics Challenge is a analytics-focused competition that challenges MBAs to use Adobe products to solve a company problem. Over $50,000 is handed out each year to top candidates from schools such as NYU, Duke, Kellogg, BYU, UC-Berkeley, and more. MBAs can also apply for Adobe’s two-year rotational program, which allows MBA grads to rotate between three different teams within specific business units or functional groups. Then, at the end of two years, the MBA grad can decide where they fit best. Superstores don’t run themselves, you know. While most think of Walmart as a minimum-wage, retail job, the company’s corporate offices are always looking to ad MBA talent that will impact Walmart’s 230 million weekly customers. According to Paysa, an MBA candidate at Walmart earns an average of $102,486, ranging from $91,638 at the 25th percentile to $112,090 at the 75th percentile. Top earners get more than $122,726 per year. Walmart recruits MBAs through its internship program. Internships run 10 weeks and are offered at Walmart’s Bentonville, AR offices, and Sunnyvale, CA offices. Interns are assigned a project to own and drive during the summer. These projects fall into departments such as marketing, eCommerce, merchandising, and more. Interns are well paid—making between $5000 and $8000 per month—and the majority are offered a full-time position or return internship at the end of the summer.